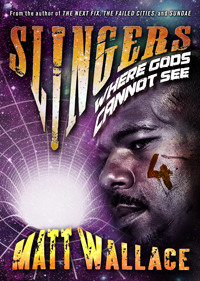 SLINGERS: WHERE GODS CANNOT SEE is the fourth ebook in the five-part Slingers Saga, an epic fiction serial by Matt Wallace, the award-winning author of THE FAILED CITIES. In this exclusive bundle you will receive this 20k-word ebook in MOBI, EPUB, and PDF format compatible with most ereaders on the market, including Kindle devices. You'll be buying this bundle directly from the author, DRM-free, and at a 33% discount off its Amazon price. The first championship match of the season looms large and lethal in The Reapers' immediate future, as do their most hated opponents. For Xenia Montelongo the most important match of the year is her first leading the team as their captain. For Hamza and Hala Saleed, after being thrust into the global spotlight as The Reapers' new starting slingers and after a shocking incident that has gone viral, it's their first time standing the deadway in mortal combat. WARNING: Contains intense violence, futurism, and sexual situations. Visit SlingersSaga.com to learn more about the series, and for information on purchasing the other volumes.